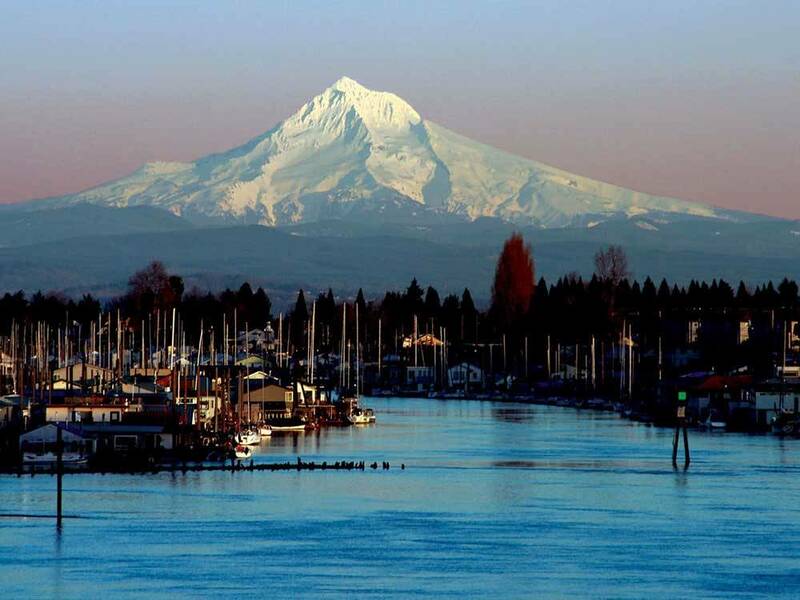 Located on the mighty Columbia River in the beautiful Portland area. Jantzen Beach RV Park has the quiet, open, fresh-air feel of the country with the conveniences & attractions of nearby Portland. Walk to shopping, dining. The staff would not honor the good Sam's mobile coupon of 20% to the point wile I was staying there they discutuned that promo. The pools were closed. I asked the office if they were closed for the winter and she replied that they were closed just because. I just want everyone to know every single time I walked in the rest room there were nasty toilets looks like they need to check on them a little more. For the up note the park was just a close lift ride to downtown. We were very disappointed with this RV park. (Especially since Good Sam has given it high reviews and higher than the park to where we moved in Portland which is vastly superior.) The worst problem is that this is not a place for campers. It is dirty, filled with people living there long-term and hoarding items. There is no enforcement of or perhaps no existence of policies or rules. There was a stench within and next to our site that was truly disgusting given that the hoarded items stored outside (think blankets, bags, etc.) in the campsites became wet given the constant rain in Portland outside of summertime. The garbage area with "recycling" is overflowing with junk including shopping carts, old couches, etc. In short, it is dirty, junk-filled and a truly uncomfortable place to stay as a camper. We let our dissatisfaction be known as well as our desire to leave early given these problems and were met with rudeness, lack of care and overall disinterest. They clearly know about their issues and do not seem to care, nor have a problem with the fact that their ratings are so far from the actual user experience that they are a joke. The facilities themselves including laundry are okay. The restrooms are sub-par, smelly and the fact that the park chooses to have them cleaned and closes them first thing every morning (when most people are getting up and would like to shower, etc.) is not. The playground is nice and it looks like the pool is as well. Unfortunately, none of this makes up for the fact that the park is dirty and very unappealing. I urge Good Sam to send the reviewer there ASAP as this discrepancy is not good for other campers nor for your own brand. We have stayed at plenty of parks with ratings of all 9-10 and they are so superior to Jantzen Beach RV park that it's disorienting. Please rectify this so that no one else becomes stuck there or loses money for leaving early as we did as soon as we could find another site. OPINION ONLY: So let me start by stating that we have some very good friends that are permanent residence (PR) at the park they are staying at. In fact we noticed that the majority of PR take pride in the way they keep there site. That being said, we have also experienced some PR take liberties at there site that are shameful. For example, we just checked out of beautiful park in Portland that had a very large community of PRs. We saw some beautifully kept sites with flowers and well kept grounds surrounding there unit. In fact we witnessed some PRs watering there lawn. However there were lots of PRs at this park that seemed not to take this kind of pride. We saw household furniture, couches, tables, refrigerators, cars on jacks, multiple automobiles (more then two), trash etc. And very old units that have not been maintained. So here is my opinion— Surly one might say I’m a snob or one might say I’m being to critical of these folks. But the real issue is not the good folks living there. Its the park owners and managing staff that creat this problem. There are, or should be rules at these parks that prohibit this from happening. And there should be staff that enforce these rules. I believe they have a responsibility to the rest of the campers to keep there parks maintained. In conclusion, there needs to be better transparency when booking a site. Parks should list the percentage of PRs camping at there park. And ALL rules and policy’s should be posted on there website pertaining to the responsibilities of campers maintaining there site. Im done ranting sorry. Not able to use satellite due to trees blocking. RV parks don’t seem to appreciate how irritating it is to me when I cannot use my satellite. They say, but we have cable, but that’s not the point. I have gone to the expense to have the dish installed and I pay the monthly charge for the service. So when I cannot use it I find it very inconvenient. In the office they have a poster listing the amenities of the park and it includes “Dish Friendly”. Other than that, this is a nice park with good quality facilities. The driveways and site pads are asphalt. Yes, there is noise from the airport and from trains but you’re right across the river from Vancouver, WA, and a short distance from Portland, OR. We had a back-in site with full hookup, 50amp electric. The WiFi is through TengoInternet and we found it to be reliable. We didn’t use the pool but it looks nice. The park is convenient to some shopping with a large shopping plaza just across the street, although that does not include a grocery store, unless you count Target. The bathrooms were in good condition and kept reasonably clean. We were there during 4th of July so I’m sure that presents a challenge. We paid $33.30 per night, blended weekly rate plus some days at a daily rate. Very noisy as it is directly under Portland International Airport flight path. There is constant jet noise 24/7 making it difficult to sleep or carry on a conversation. It is situated in a large mobile home community. It is clean and the staff friendly also the hookups are good. If you don’t mind the noise factor it is fine for a day or two. Anything more than 2 stars here is a marketing ploy... Planes, trains and automobiles. 5:00 AM sharp every morning - fighter planes, commercial planes, a train nearby and every loud exhaust in town. This park is joined by a sketchy trailer park in the middle of a "rough" neighborhood. Sites are back to back and I am literally 2 inches from my neighbor to the rear - window to window. There's not enough room to park an RV and a car and I"m right next to a tree so no awning. They do have cable TV - 10 stations and 8 of them are either PBS or infomercial stations. Wifi is a joke. The only bright spot here is the staff. They seem nice. 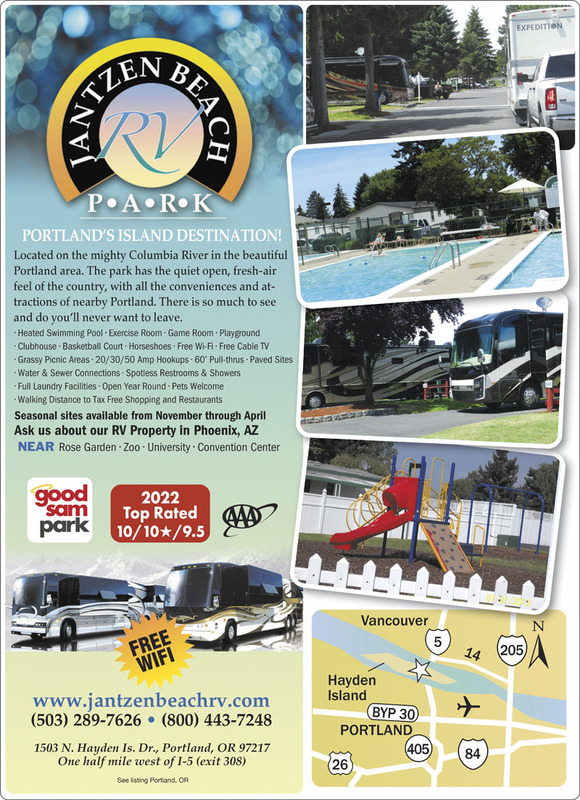 Janzen Beach RV Park, Portland OR. Just over the border from Washington and easy to get to, this park had a lot to offer. The sites were all paved with trees and other plants as well as stone walls. The pool was large, warm (it was in the 50s outside in the morning), and very clean. WIFI, was better than most. The issues we had were that the bathroom entry was by a card reader and we only had one card, so we had to travel as a group to shower or the bathroom if needed. While everything was clean and looked well tended, the showers were dirty (the grout). Over all, a nice over night stay if you don't mind the constant roar of jet engines taking off from the Portland airport. No way this place is the quiet retreat their website advertises. A busy international airport is literally next door. Military jets taking off, trains starting up. The RV Park is set within a trailer park of permanent residents. Not necessarily high end trailers either. Therefore there is a lot of traffic. Women's showers have no place to place your stuff and only one hook; your stuff goes on the floor. I found the bathrooms messy. There should be security being so close to a major city. There isn't. Not even something to hang in your car to show you belong there. So we did not feel safe leaving our stuff out though we did rather than put it away every day. Just didn't feel secure. RV part of the facility had clean grounds. Hookups were easy. Good cable connection. People in the office were very nice. We're very disappointed. Committed to 9 nights unfortunately and didn't want to waste a day moving to another park. We stayed here for a week, and found it to be quite pleasant. The laundry facilities were very clean and everything was working well. The staff was very friendly and helpful. The park was rather large and pretty full, although it was clean and well attended to. Most folks seem to be permanent residents. Security was tight, although Portland and Hayden Island need to do something about the number of homeless people camping out all around; throughout the city and not just on Hayden Island. We definitely plan to come back and stay at this RV park! The Desk staff were very helpful. We had no complaints with them. Our complaint is with the campers parked on the other side of the hedge row. We were parked right next to the hedge. The person(s) in the motor home (Class C) ran his generator all day and half the night. At 11:00pm he decided to play his music loudly for about 2 hours and then again during the day. Making it hard for sleeping or just sitting outside during the day. The 5th wheel parked there also appeared to be dumping his gray water down the storm drain. It appears that they have both been there for awhile. Informed the campground we would be leaving a day earlier then planned due to this. Gave us a credit to use at the campground another time. (This won't be happening) Can't be the first time someone complained of this. If you do go here make sure you ask to be somewhere other then by the hedge row in the front. There are more spaces for people living in their RV's then for one night or weekends. There is road noise and airplane noise but at night it slows down. Pet Friendly and again no complaint with the desk staff. A 10 is not accurate for the restrooms, they are clean but not a 10, more like a 7. Easy access to downtown and shopping, but the island is littered with homeless. The first thing out of a neighbors mouth was to lock up everything. It is also more of an extended stay place, with an attached mobile home park and "long term" area, my neighbor had been here for 2 years...and you could tell many others weren't far behind. The grounds are very nice and well maintained, and the best pool iv'e seen so far at a park. Not what we expected at all! This is more of a full time resident park. There is a trailer park adjoining. Bathrooms are not well maintained- showers are disgusting! Trash in our site when we arrived- no trees, sites with trees are taken by full time residents. We were looking for more if an RV resort- this is not that! Very surprised the rating was so high for them! Enjoyed just the one night. A very busy area North of town, but there are plenty of businesses in the area. Eat at Island Cafe. The park is huge, surrounded by manufactured homes, business park, big box stores and condos. I'd say there are 200 spaces. Many of them look long term but those are well kept. Full hook up, but never figured out the cable in space #934. Al I could get was a few community service tv stations. Spaces are nice and wide for an extra vehicle. You'll here the train and the fog horn when the drawbridge goes up. Check-in smooth. Located next to the Jantzen Beach mall so there is quite a bit of road noise, and train noise from near by tracks. There are a large number of permanent residents and the park has that "feel" to it. The wifi and cable didn't work for us and we were glad to move on the next day. Next time in Portland, we will look for a different park. Conveniently located and easy on-and-off from Interstate 5, with good selection of food and retail services nearby. Plenty of pool area for the grand kids. That was important for us. The paved roads inside the part are flat and fairly easy to maneuver. Just stayed one night, but would not hesitate staying longer. Jet noise from Portland International may be a factor for some folks. Jantzen Beach was an excellent location for our needs for this trip. The convention center, local shopping and relatives were all within reach of the RV park. Be prepared to reside in a busy industrial, urban setting as "trains, planes and automobiles" are constant. A small price to pay for the convenient, clean, hospitable and useful RV park.